In response to an emergency request by the governor of Fukushima Prefecture (Fukushima Prefecture Disaster Countermeasures Office) to the governor of Hiroshima Prefecture to send radiation technologists, nurses and other medical specialists to help address the aftermath of the nuclear power plant accidents, the Hiroshima International Council for Health Care of the Radiation-exposed (HICARE) organized and sent a radiation dose measurement team to sites in Fukushima Prefecture. The team brought seven radiation dose measurement instruments with them and measured radiation doses and conducted medical examinations by interviewing evacuees in Fukushima Prefecture. 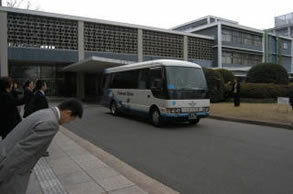 A bus containing the team members departed from the prefectural building. 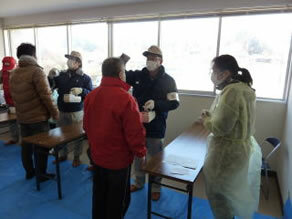 (1) Screening was conducted jointly with the Fukushima Prefectural Middle Healthcare & Welfare Office/Healthcare Center (hereinafter, the "Healthcare Center"). (2) The distance indicates the direct distance between Fukushima Daiichi Nuclear Power Station (Aza Kitahara, Oaza Ottozawa, Okuma-machi, Futaba-gun) and the location of the activity. (3) The number of people screened includes those screened by the Healthcare Center. The number of people screened by the HICARE Radiation Dose Measurement Team alone is unknown. (4) The screening level at which people should be subjected to whole-body decontamination is 100,000 cpm or more (based on the Fukushima Prefecture screening standard). (5) Only screening was conducted in the Healthcare Center (not evacuation center) on March 21. 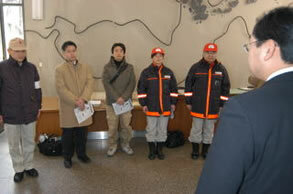 (6) On March 21, the team was divided into two groups (three persons each) and each group conducted activities in the Fukushima Prefectural Middle Healthcare & Welfare Office/Healthcare Center and Fukushima Gakuen. 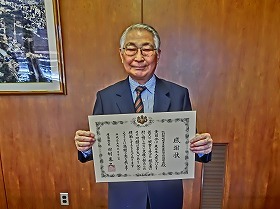 Received a "Letter of Appreciation"
We received a "Letter of Appreciation" from the Japanese Minister of Health, Labour and Welfare for our support to people affected by the Great East Japan Earthquake. We pledge ourselves to contribute further to world welfare through the utilization of our accumulated knowledge and research findings in medical care of the radiation-exposed.